photograph taken 17/07/14 by Chief Photographer, Mark Cleveland on behalf of Yellow Advertiser, for the launch of Southend Borough Council's, WW1 Centenary Events campaign. I'm one of a band of people for whom it is important to keep history alive, with particular reference to WW1, now that the last of our veterans from that period are no longer with us. I feel privileged to have been able to portray what I have done over the years and continue to do here in the USA & feel it has been invaluable for the general public & youth of today to be able to get 'up close & personal' & to be able to 'see & touch', in person, what items were like from a 'bygone era'. Seeing a film or reading a book is all very well and good, but having someone tell you what carrying all the kit felt like & being able to experience it for oneself is an entirely different thing! I also endeavour to dispel all the 'old myths' that are still believed by a large majority & replace them with facts - the old 'lions led by donkeys' & the 'futility of it all'. War, by it's very nature, is 'emotive', & it is this that often clouds the facts. All to frequently people have 're-written history' to suit their circumstances or forget previous wrong doings. Take 'poor, brave little Belgium', for example. People forget that up until around about 1912, Belgium was both 'reviled & vilified' around the world for its slaughter & mutilation of the Congolese in the Belgian Congo. I am not & do not claim to be an expert, academic, or a teacher - I leave that to my more 'learned' peers! However, I do go to 'great lengths' to ensure that I get things as 'authentically accurate' as possible & that information given is 'correct and up to date'. Anybody that claims to know all there is to know about the Great War is either a 'liar or an idiot'...It is simply not possible! New things are discovered, & 'theories' change constantly & with that in mind, this website is a constant work in progress. I regard myself more as a 'Living History Enthusiast' as opposed to a Reenactor & to me, yes, there is a difference. For me a 'reenactor' is someone who does it for fun. They depict a certain moment in time & get great enjoyment charging around, guns blazing & if people can take something away from that, then fine. One gets the feeling that they'd charge around doing what they do regardless of whether there was an audience or not! 'Living Historians' on the other hand, are there to 'enhance' visits & impart information. They've gone to a great deal of trouble in researching kit, etc, & at some point they have usually 'lived the part', up to a point (I've spent the night under canvas & shivered on the 'fire-step', & been wet & muddy in a trench, & eaten 'bully & biscuit'!). For LHEs', an audience is a necessity. 'WDYTHYA' shows, 'Armed Forces Days' & other events, done a charity walk from London- Brighton for Blind Veterans UK (formerly, 'St Dunstans'), in WW1 Officer kit & supported Churches Conservation Trust projects as well as a number of Centenary events. 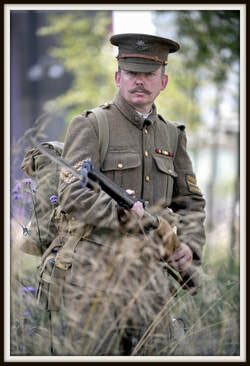 I also appeared in a short student film project ('Ralph') back in 2013, as well as the various, usual WW1 events. With the increase in demand for attending schools & child orientated events, I now hold a 'personal' CRB / DBS Certificate. In 2014 I undertook a personal pilgrimage to the Western Front to visit the areas that both my Great Great Uncle and a 3rd cousin fought at and I was lucky enough to locate my Great Great Uncle's final resting place at Ecovries Military Cemetery, Mont St Eloi. In October 2015 I took part in a sponsored 3 day trek across the battlefields of the Somme from Lochnagar Crater to the Menin Gate on the Ypres Salient dressed as a WW1 Stretcher Bearer complete with Branchard Nemier Seat Stretcher in aid of 'The ABF - The Soldiers' Charity' and was lucky enough to visit 'Le Touret Memorial to the Missing' where my 3rd cousin is remembered. Since being Stateside I have been lucky enough to do a few events with the Illinois State Military Museum, and a few other events. ​My collection is mainly British orientated. In this picture is good friend, former driver and some times batman, Peter Austridge who is based back in Blighty.